The National Library of Spain (Biblioteca Nacional) is situated in an impressive neoclassical building to one side of Plaza de Colón. The library shares a roof with the National Archaeological Museum. The library was founded by King Philip V in 1712 as the Palace Public Library. The Royal Letters Patent that he granted, the predecessor of the current legal deposit requirement, made it mandatory for printers to submit a copy of every book printed in Spain to the library. In 1836, the library's status as Crown property was revoked and ownership was transferred to the Ministry of Governance. 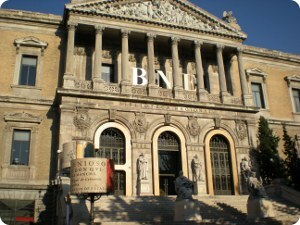 At the same time, it was renamed the Biblioteca Nacional. The facade of three entrance archways and wrought-iron gates is fantastically beautiful. The building also hosts statues of Alfonso X (The Wise) and San Isidoro before the grand main staircase. Other great works of art and sculpture adorn this beautiful bibiloteca, but the work of the library today is researching and archiving the history of Spain's documentary heritage. The National Library Museum, formerly known as the Book Museum, offers the institution's educational, training and leisure activities for the wider public and disseminates the collections, the working and history of the National Library. • Sala General: Monographic works from the 16th century onwards, encyclopaedias, dictionaries, catalogues and directories. • Sala Alcalá de Henares: Attention! This room is located in Alcalá de Henares for consulting the collections stored in its depository. • Sala Cervantes: Antique assets. Ancient and modern manuscripts, incunabula, early printed matter, theatre plays and works by Cervantes. • Sala Goya: Engravings, photographs, posters, maps and drawings. • Sala Barbieri: Music scores, sound records and audio-visual resources. • Sala de Prensa y Revistas: Newspapers, journals and periodicals, official gazettes and online resources about periodical publications. • Bibliographic information: Room for consulting general and specialist bibliographies, catalogues, etc. • Librarian documents: Works in all types of media specialising in library science and documentation. This is a superb place for the bibliophile or researcher to spend hours. For the tourist, the building's beauty and the massive collection are well worth seeing. Monday to Friday: From 9:00 to 21:00. Saturday: From 9:00 to 14:00. * More info about the Opening hours: BNE Museum. * Line 4 - Colón station.